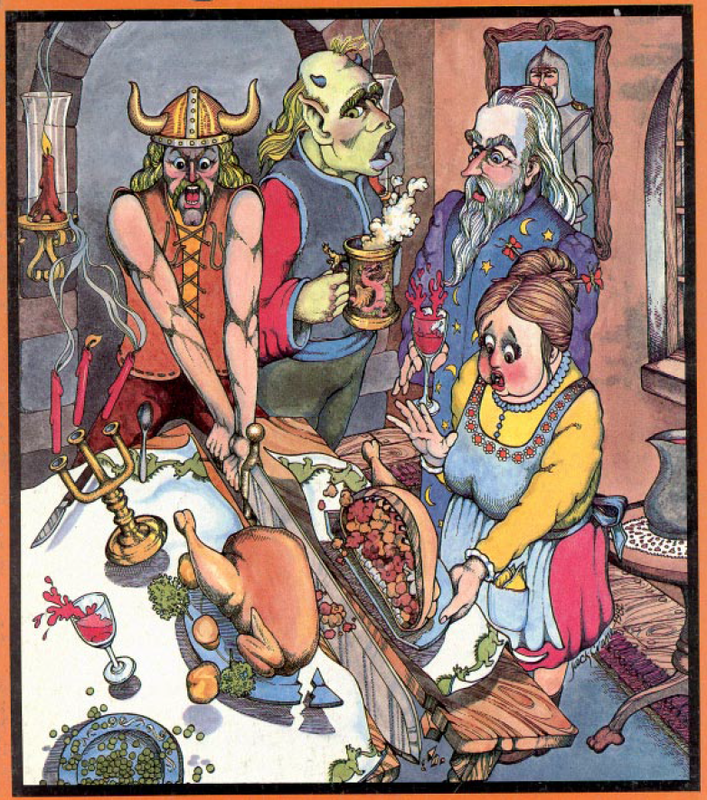 This festive scene is from one of six covers that Jack Crane drew for Dragon Magazine. He also did some interior art for the magazine and wrote a short story, "The Legacy of Hortus", which appeared in Issue # 87. I’ve always been a bit of a non-conformist, as is probably the case with most artists and creative types. And I’ve always rejected the “norm”, meaningless rules, and established styles for almost everything. My style of drawing is … my style of drawing … as is the case with most artists. And when I first started working for Dragon I was unambiguous about insisting that I never create art depicting one human being inflicting death or injury upon another human being … or any other sentient beings. This seems to be a predictable response to having spent four years in the military with one of those years in a war zone. Kim (Mohan) was perfectly comfortable with those parameters. Fair enough. His pieces stand out from other fantasy offerings of the day partly for their whimsical humor and Art Nouveau-style use of shading and colors. Add another important mark to Old School art: it was diverse. Luckily, he didn't apply his otherwise laudable philosophy to holiday turkeys. The other covers, including the iconic Tree-Men in the Dismal Swamp (# 54) and the unforgettable Andragon (# 96) can be seen in the same Black Gate post, among other places. Since the 1980's he has had a great diversity of non-fantasy art commissions including newspapers, trade, hobby and craft publications as well as three-dimensional legal displays for law firms. Recently he publicly returned to fantasy art, doing some work for Gygax Magazine. Great stuff.